Please note that the content of this book primarily consists of articles available from Wikipedia or other free sources online. 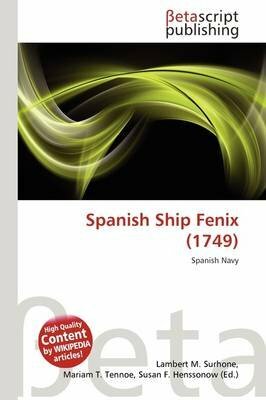 Fenix was an 80-gun ship of the line of the Spanish Navy, launched in 1749. She fought at the Battle of Cape St Vincent on 16 January 1780, as the flagship of Admiral Juan de L ngara. She was captured by the Royal Navy during the battle, and was commissioned as the third rate HMS Gibraltar in March that year. She took part in the Battle of Cuddalore in 1783. The Spanish Navy (Spanish: Armada Espa ola) is the maritime branch of the Spanish Armed Forces, one of the oldest active naval forces in the world.